Spending an evening cooking in my kitchen is an ideal way for me to unwind and reflect on the day. Sometimes, however, I end up alone. I suspect (no, I know) it’s because it gets a little loud. I like my music loud. He doesn’t. These cookies were a great find. They’re quick, they’re good, and one batch makes a lot. But here’s another great find: purchase this album from your iTunes store for 9.99 and $8.46 of that goes to the Philippine Red Cross for their relief efforts in the aftermath of Hurricane Haiyan. Search for Songs for the Philippines. This benefit album contains 39 songs from big name artists–everything from Beyonce to Bob Dylan, Katy Perry to U2. Bake, sing, serve good cookies and everyone benefits. 2. Melt the butter in a medium saucepan. Remove from heat and add the coconut. Mix well so the coconut is well coated with the butter. 3. Beat the eggs with a mixer on medium speed just until blended. Add the sugar and beat on medium-high until the mixture is light-colored and fluffy. Combine the butter-covered coconut gently with the egg mixture and mix well. 4. Drop the batter by teaspoons about 1 inch apart onto the parchment-covered baking sheets and press down gently on the mound until it is relatively flat. Bake for 7-10 minutes until golden. 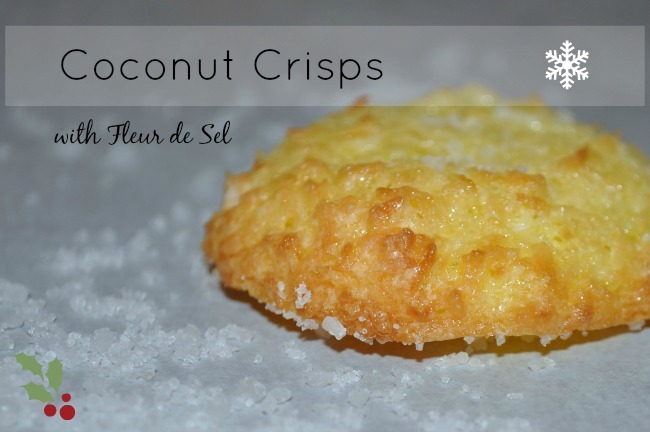 Remove from the oven and immediately sprinkle the tops of each cookie with a pinch of the fleur de sel so that it will stick. Slide the entire sheet of parchment with the cookies intact onto a wire cooling rack. As soon as they are cool, place in an air-tight container to maintain their crispness. 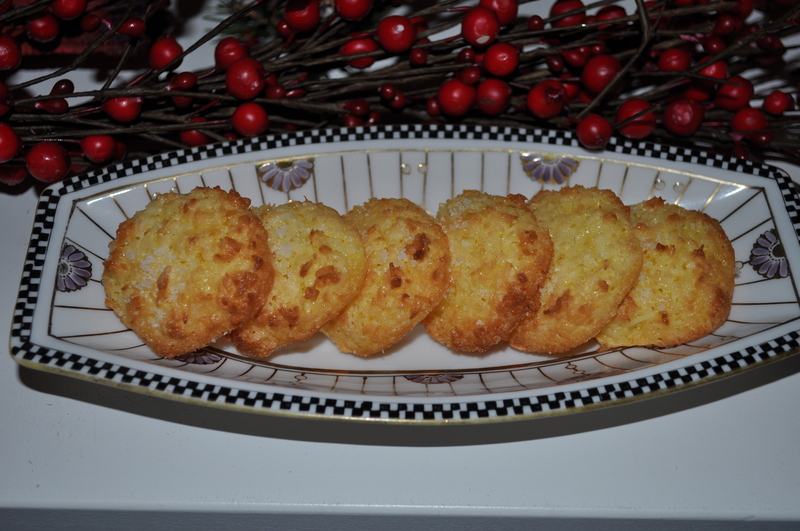 This entry was posted in Christmas, cookies and tagged coconut cookies, coconut cookies with fleur de sel, coconut cookies with salt, coconut crisps, salted coconut cookies. Bookmark the permalink.